Hailing from Chicago’s renowned Wax Trax Records stable of bands, MY LIFE WITH THE THRILL KILL KULT creators Groovie Mann and Buzz McCoy have been conjuring up sonic tales of blasphemy, sexcapades and kitschy horror for over 25 years. Their sound is a concoction of experimental, disco, rock, new wave, lounge and glam, interlaced with their signature use of “sampled dialogue” – a reflection of the duo’s musical influences, and insight into the their taste in cinema. In fact, the original concept of MLWTTKK was to be trashy B-movie, in the style of John Waters and Russ Meyers. 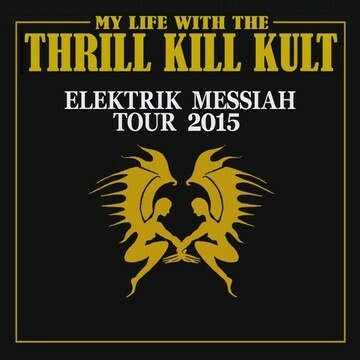 MY LIFE WITH THE THRILL KILL KULT’S sound has always been fearlessly experimental and has become hugely influential to many artists today. They continue to morph and stretch the fabric of music and as we know it, always remaining true to the KULT and true innovators. This show got postponed to this Friday due to a band member's illness. Come on out! What better way to spend your Friday the 13th?